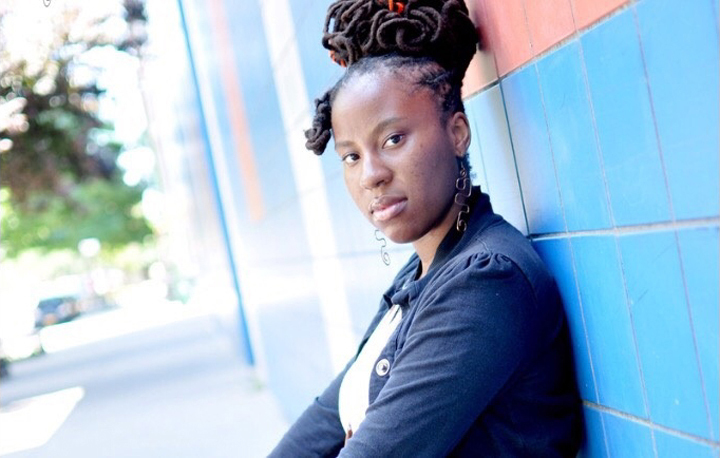 Sherese Francis is a Southeast Queensbased poet, writer, blogger and literary curator. She has published work in journals and anthologies including Art in Odd Places, Bone Bouquet, African Voices, Newtown Literary, Blackberry Magazine, Kalyani Magazine, and Near Kin: A Collection of Words and Art Inspired by Octavia Estelle Butler. In August 2017, she published her first chapbook, Lucy's Bone Scrolls: The Black Speculative Mystery School. Sherese has also facilitated workshops for No Longer Empty, Lewis Latimer House, New York Writer's Coalition and Newtown Literary. Additionally, she is a board member for the small press imprint Harlequin Creature. Her current projects include her Afrofuturism-inspired blog, Futuristically Ancient, and her Southeast Queensbased pop-up bookshop/mobile library, J. Expressions, which is dedicated to promoting and growing the literary community in the area and for which she received a 2017 Queens Council on the Arts grant for her Reading (W)Riting Remedy series. Please join Sherese and all our accomplished readers for Line Break #19, Saturday, June 2, 5:00 p.m. at Q.E.D. in Astoria. Tickets are only 7 bucks! Julie Threlkeld has been performing in storytelling shows in and around New York City since 2011. She has appeared as an invited storyteller in shows like RISK!, Talk Therapy Stories, New York Story Exchange, and The How I Learned Series, to name just a few. Podcast appearances include RISK!, A Funny Thing by Splitsider, The Whole Story, and Succotash: The Comedy Podcast Podcast. Her solo show, Generator: A Disastrous Love Story, premiered at The Tank theatre in Manhattan in 2015 and hasn't been heard from since. 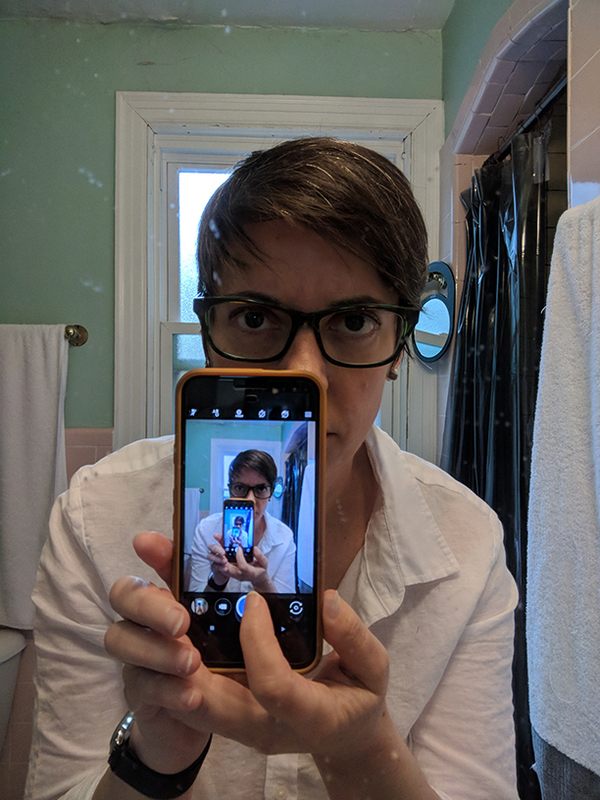 Julie is also the creator and host of Modern Stories Mix, a studio-recorded podcast that turns a sonic Klieg light on one story (and one storyteller) each episodealthough the show is currently on hiatus. In addition to storytelling, Julie occasionally performs standup comedy. She sometimes composes and performs music. From time to time she guests hosts a storytelling show. Or she writes a poem. Or maybe makes a short film. Even less frequently she engages in random acts of journalism, having written about anxiety for The New York Times and about the strange, obsessive world of professional distance running for Runner's World and Running Times. By day Julie works as a content strategist and writer in the user experience group of a large technology company. By night she eats and sleeps with fellow Line Break reader Jonathan Sumpter. Upcoming summer appearances include Big Irv's Pet Detective Agency (May 26), Storytelling at Halyard's (June 10) and New York Story Exchange (July 10). 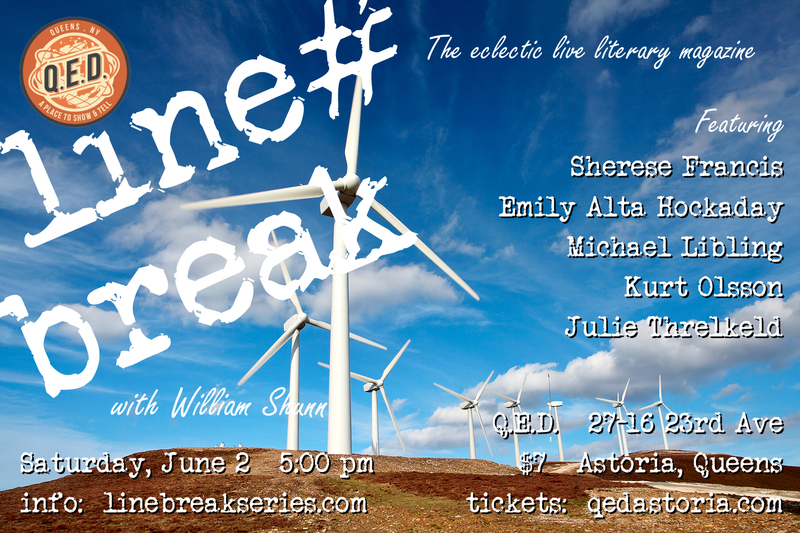 Please join Julie and all our world-class readers for Line Break #19, Saturday, June 2, 5:00 p.m. at Q.E.D. in Astoria. Tickets are only 7 bucks! 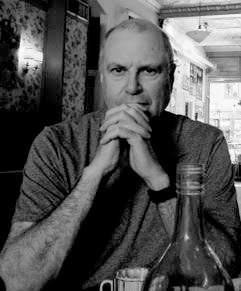 Michael Libling's fiction has appeared in The Magazine of Fantasy & Science Fiction, Asimov's Science Fiction, Amazing Stories, SciFiction, Realms of Fantasy, OnSpec, and several anthologies, including Ellen Datlow's Year's Best Fantasy & Horror and Gordon Van Gelder's recent Welcome to Dystopia: 45 Visions of What Lies Ahead. His novel Hollywood North: A Six Reeler, based on his World Fantasy Awardnominated novella, is forthcoming from ChiZine Publications. As for day jobs, Michael has been a talk radio host, a newspaper columnist, and ad agency creative director. The father of three daughters, Michael lives in Montreal with his wife, Pat. For the whole unseemly story, go to www.michaellibling.com. 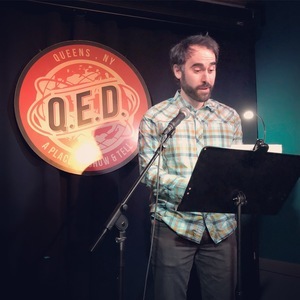 Please join Michael and all our amazing readers for Line Break #19, Saturday, June 2, 5:00 p.m. at Q.E.D. in Astoria. Tickets are only 7 bucks! And please mark your calendars for Saturday, June 2nd, when we'll return at the special time of 5:00 pm for Line Break #19, featuring World Fantasy Award nominee Michael Libling, Afrofuturist author Sherese Francis, poet and editor Emily Alta Hockaday, storyteller and essayist Julie Threlkeld, and poet Kurt Olsson. Don't miss it! We hope you're having a great spring, Line Break fans! 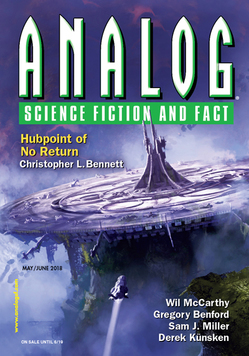 Our month of wonderful things to read continues with a small amuse-bouche from your host, William Shunn, whose poem "Telegraph" is out on newsstands now in the May/June issue of Analog Science Fiction and Fact. 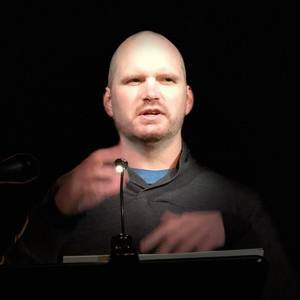 In fact, Bill is currently the featured poet over at Analog this month, where Emily Hockaday is associate editorthe same Emily Hockaday who will be reading her own poetry at Line Break #19! So please, mark your calendars! Be sure to join us Saturday, June 2nd, at the special time of 5:00 pm for a stellar lineup that will also feature World Fantasy Award nominee Michael Libling, Afrofuturist author Sherese Francis, storyteller and essayist Julie Threlkeld, and poet Kurt Olsson. Don't miss it! Schedule Change Alert! Please note that our June episode will take place at the special time of 5:00 pm. Read David Barr Kirtley's "Power Armor: A Love Story"
...if you were with us back in January, our friend David Barr Kirtley dropped by to read us only the first half of his sci-fi romp "Power Armor: A Love Story," a tale of alternate timelines, unlikely romance, and, of course, power armor. The audience was devastated when, for reasons of time, Dave had to stop halfway through. But don't worry! If you didn't manage track down the link to the story back then, we have it for you right here. Listen to Sam J. Miller on NPR's Weekend Edition! Hello again, Line Break fans! As a reminder, we're on hiatus for the month of May, so we won't be having a show this Saturday at Q.E.D. However, we don't want to leave you high and dry for the month, so we'll be popping up from time to time to tell you about some wonderful things to read. First up, back in November our friend Sam J. Miller stopped by to read for us from his novel The Art of Starving. Well, we're happy to report that Sam's new novel, Blackfish City, has just come out. Not only is it well worth your time to check out, but Sam appeared on NPR's "Weekend Edition" a couple of weeks ago to talk about it with host Scott Simon! It really is a charming interview, so please give it a listen. Then buy yourself a copy of Blackfish City! Don’t miss Justin Weinberger’s script tonight on THE AMERICANS! The Center has an important new assignment for you, Line Break fans! Listen carefully, memorize your mission, then destroy this tape. 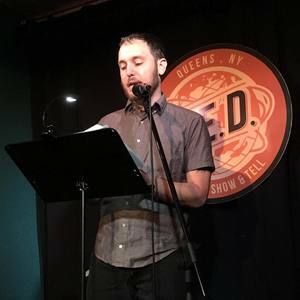 Last month at Line Break #18, we were treated to a chapter from Justin Weinberger's novel-in-progress. But besides being a novelist, Justin also writes for The Americans, which many regard as the best scripted drama currently on television. 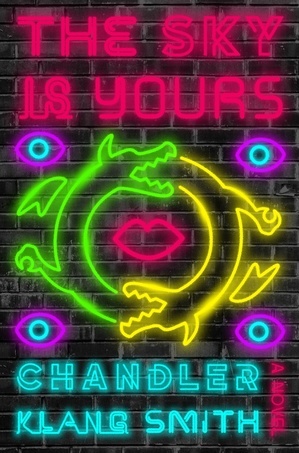 His episode, co-written with the legendary Stephen Schiff, airs tonight at 10:00 pm on FX. This is Episode 6 of the sixth and final season of The Americans, and the screws are turning ever tighter for the show's titular married Russian spies. What's more, the title of the episode is "Rififi," and we're intrigued by the connection to that classic heist film. So tune in, comrades. It's your patriotic duty! Greetings, Line Break fans! With all this crazy weatheroppressively warm one day, freezing gales the nextwe've decided to get out of town for a while. Line Break will be taking a brief hiatus for the month of May, but we'll be back on June 2nd with one of our best lineups yet! Mark your calendars, and please join us that day at the special evening time of 5:00 pm. Get your tickets early!